Downwind beauty - The Loes and their crew sail the J/70 DIME downwind at the 2017 Corinthian Nationals. Photo by Chris Howell. Regular crew: Jen Glass, Ben Glass, John Loe, Kit Fontenot, Catherine Loe, Barrett Fontenot, Will Loe, and Farley Fontenot, and featuring team mascot William Loe IV. Why did you choose this class, and what do you like most about it? First and foremost, we chose the class for the competition. The J/70 has the largest and most competitive fleet in our budget. Second, we wanted a boat we could sail together and be competitive in. The boat is forgiving enough in weight, so we have a bunch of potential combinations that work well with the family and friends we race with. Finally, the boat is pretty easy to sail. We have very limited practice time but don’t feel that we get beaten by superior boat handling; instead, the top boats are sailing smarter than us, going faster, and hitting the shifts. What is the biggest challenge your team has had to overcome, and how did you do it? Logistics was, and still is, a big challenge for us. We live on the other side of the country and usually travel with our child. Wrangling flights, boat transport, nannies, grandparents, and scheduling time for boat maintenance is challenging. Fortunately, we’ve gotten a ton of support from our siblings, parents, and great group of friends. Boat Speed. We aren’t consistently in the top echelon of the fleet. It is brutally difficult to be in 15th place in a big fleet. There are very few lanes, and so many of your decisions are dictated to you. We have had moments of brilliance winning several races, but we aren’t consistently fast enough to win a big event. Our goal is to win the Worlds. We’re looking forward to the Worlds. It will be our first five-day event, and we’ll be leaving the little guy at home. We’re looking forward to getting completely into race mode for a big block of time. The team at Quantum has been extremely generous with their time. This is the first keelboat/sport boat we have campaigned, and we’ve had a lot to learn. Initially we stuck closely to the tuning guide, but, with a lot of help from the Quantum team, we now feel like we better understand the goals for rig and sail setup. This has let us confidently diverge and build our own bespoke guide. Now we’re starting to see the little incremental speed gains. 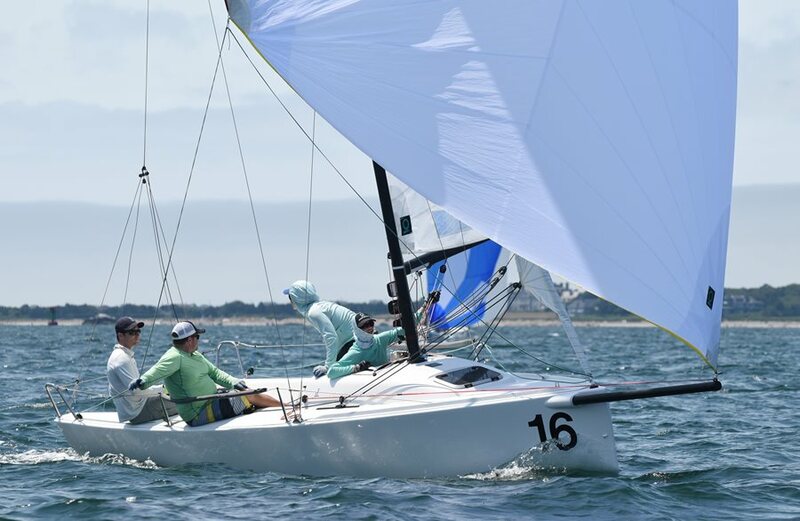 Making waves - Mallory and Andrew Loe take on the second event of the 2018 Quantum J/70 Winter Series. Photo by Chris Howell. We’re proud that we’re relevant; the top boats know who we are. Given our big constraints on time and budget we’re very proud of our results, but it’s a long way to the top. As a Corinthian team, what are your tips for being competitive against the rest of the fleet? Ruthlessly prioritize. 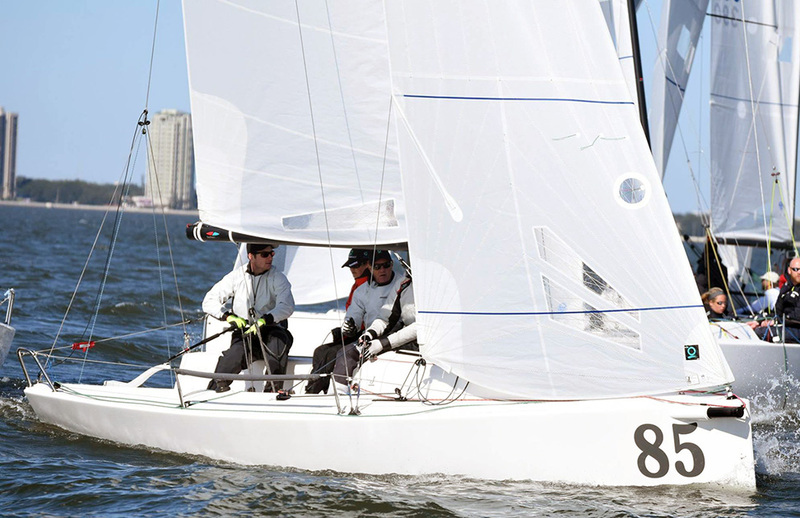 Spinnaker sets are not the reason the top boats are consistently in the top; don’t practice them if you are only losing one or two boats at each top mark. More likely, you are losing 40 boats at the start of each race. If you can’t consistently start in the front row and go straight for five minutes, that’s the thing you need to practice. During the morning before racing, we spend 75 percent of our time testing speed with boats faster than us; 24 percent of our time deciding where to go on the first beat; and one percent on everything else. We have a private Facebook page where we post witty banter and debrief events. We’ll also post pictures of top boats and discuss things we can see and want to try, like a boat’s inhaler setup or their heel angle. We spent a bunch of time trying to come up with a really crafty boat name. We wanted something that was “on the nose” but not completely offensive. It turns out that is a tough balance to strike, so we just had no name for a while. After a few months, we were driving and some awesome late 90s/early 2000s “crap rap” came on. Mallory has a passion for the music of this era and immediately started singing along, so we’d like to acknowledge and thank the Ying Yang Twins for the inspiration. What's your advice to a team new to the class or to other teams trying to be successful? Again, ruthlessly prioritize. You’re probably slow, and everything else is painful because of that. Get faster, and fix the other things later. Spend time and money on getting faster. That usually means spending more time on the water, not on spinnaker sets or a fancy winch cover. Learn all the moves. Know when to wing-on-wing, when to gybe set, when to pinch-to-duck, etc. Most of this is only learned by trying. You’re going to do it at the wrong time a bunch before you figure it out. At each event, decide ahead of time if you’re going for your best result or if you’re going to maximize learning. Commit. If you’re a poor starter, get aggressive, and go collect some letters.